Correspondence, notes, research transcripts, coin photographs and pictures, and original eighteenth century documents, all relating to Douglas’s research into post-1783 U.S. state coinage. Numismatist and engineer Damon G. Douglas (d. 1974) was born in Worcester, Massachusetts, and grew up in Jacksonville, Florida. Damon G. Douglas papers, 1774-1793, 1943-1961, Archives, American Numismatic Society. Numismatist and engineer Damon G. Douglas (d. 1974) was born in Worcester, Massachusetts, and grew up in Jacksonville, Florida. He graduated from Cornell College of Civil Engineering and went to work at Turner Construction Co. in New York City. In 1931 he started the Damon G. Douglas Construction Co. in Newark, New Jersey. He became a fellow of the American Numismatic Society in 1943 and was a member of the Society’s standing committee on United States coins. He also served as president of the New York Numismatic Club from 1949 to 1951. Beginning in the 1940s, he published articles on numismatics in The Numismatist, the monthly journal of the American Numismatic Association, and other publications. 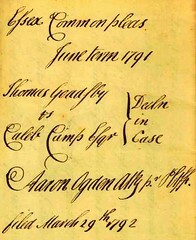 Correspondence, notes, research transcripts, coin photographs and pictures, and original eighteenth century documents, all relating to Douglas’s research into post-1783 U.S. state coinage. Includes annotated, unpublished typescripts for Bungtowns, James Jarvis and the Fugio Coppers, and The Copper Coinage of the State of New Jersey, the latter edited by Gary A. Trudgen and published posthumously in 2003 by the American Numismatic Society. Correspondence (1943-1961) concerns research on topics such as the origin of the term “Bungtown,” individuals such as Matthias Ogden and James Jarvis, and Fugio coppers. Also includes typed transcripts, photographs, and copies of documents (1774-1802) as well as original late eighteenth century documents (1786-1793). One box contains photocopies of the unpublished typescripts.